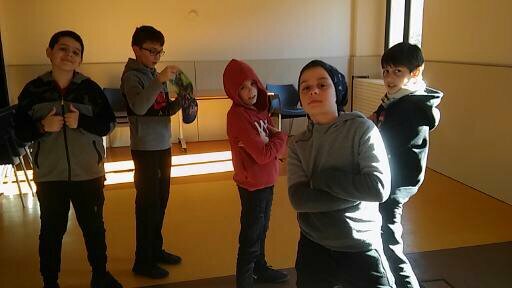 The English Club: 5th grade Who is the best ?? 5th grade Who is the best ?? Hello everybody, We can do many things with 5th grade but moving and games they like a lot. So while moving we use sentences like I'm the most dangerous, I'm the most intellegent or simply ; I am the best ! We made a cartoon about a superheroe as well. The idea the following story to draw a victem who is shouting for help, the superheroe appears ; ¨I will rescue you¨ ,then the bad person appears ; ¨No you won't ¨ and a final fight. Some boys were not in the mood for drawing so they used the sentences in a ball game.